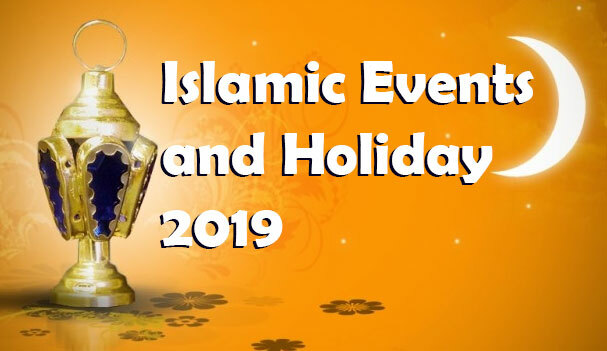 We have listed the important 2019 Islamic Festivals 1440/1441, Holidays and Events as per the calendar year 2019. 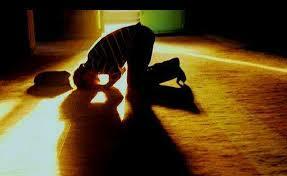 These Muslim religious holiday can vary as per the sighting of moon and the lunar calendar. Hadith recorded in Tabrani on the authority of Abdullah ibn abbas (رضي الله عنه) Abdullah ibn abbas Radi Allahu Anhu reports that Rasulullah Sallallahu Alaihi Wasalam said, "Whoever recites the following Durood once, Allah will instruct the angels to keep writing good deeds for him for a Thousand days"
Hazrat data ganj bakhsh rahmatullah allahi was born in the city of ghazni during the reign of mahmud of ghazni where his family had settled. he was known as ali al-jalabi al-hujwiri (ra), as he had lived in jalab and hujwir, two different quarters (mohallas) within the city of ghajni. 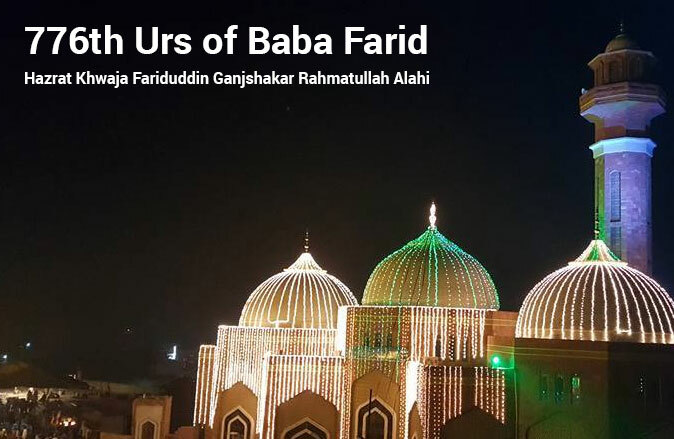 Hazrat Khwaja Fariduddin Ganjshakar Rahmatullah Alahi also known as Baba Farid or Shaikh Farīd is celebrated every year for six days in the first Islamic month of Muharram, in Pakpattan, Pakistan. 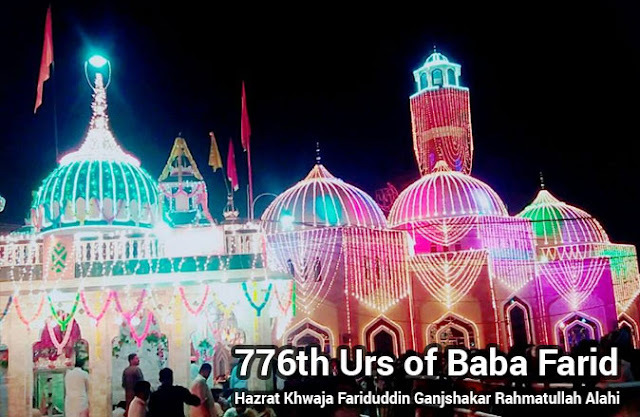 The 776th urs of Baba Farid begins from 15th and 16th September 2018. During this period, on 5th and 6th of Muharram, The Bahishti Darwaza (Gate of Paradise) is opened only once a year. Devotees wash this place with rose water before the opening ceremony. Thousands of pilgrims and visitors from all over thr world come for the blssings of Khwaja Fariduddin Ganjshakar Rahmatullah Alahi. 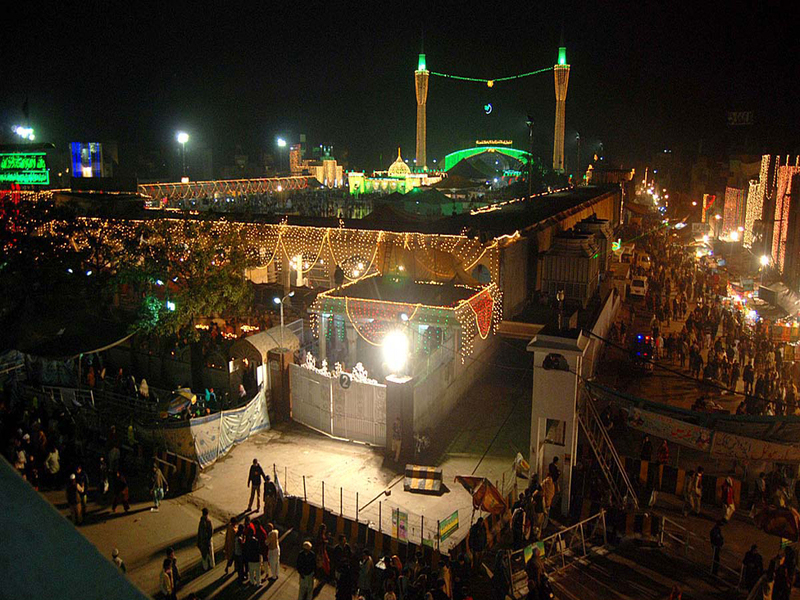 The Urs is celebrated every year from the fifth through the tenth of Muharram. Some of his personal belongings were taken by his descendant Sheikh Salim Chishti, and kept in a fort built by his descendants in Sheikhupur, Badaun, where they are preserved in a conatiner called Pitari. To this day it is taken out in a procession for the first six days of Muharram. Baba Farid's small tomb is made of white marble with two doors, one facing east and called the Nuri Darwaza (Gate of Light) and the second facing north called Bahishti Darwaza (Gate of Paradise). There is also a long covered corridor. Inside the tomb are two white marbled graves, one belonging to Baba Farid and the other belonging to his elder son. 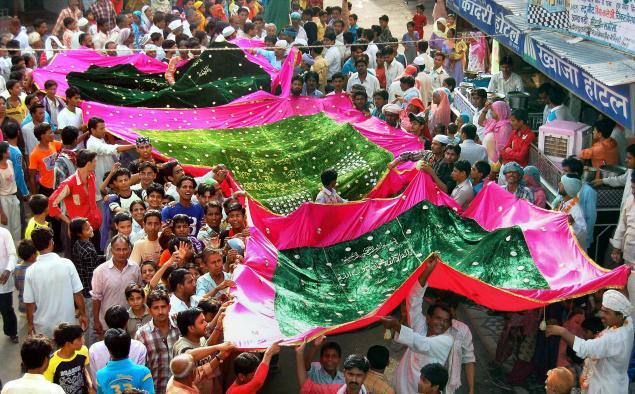 The graves are always covered by green sheets of cloth called Chadders and flowers that are brought by visitors. This prediction of Hazrat Khwaja Moinuddin Chishti of course proved to be true. After his meeting with Baba Farid, Hazrat Khwaja Moinuddin bestowed a "Khil'at" (dress of honour) upon him and Hazrat Qutbuddin wrapped the "Dastar-e-Khilafat" (a turban symbolic of this recognition) upon Baba Farid's head. When Hazrat Khwaja Moinuddin prayed for his success after the ceremony, a "nida" (divine voice) declared: "Farid raa bargazidaim" — "We have accepted Farid". After the death of Hazrat Khwaja Moinuddin Chishti, Hazrat Baba Farid visited the saint's shrine at Ajmer where he performed a chilla in an underground cell which is still preserved today and is known by the name of "Chilla Baba Farid". It remains closed throughout the year and is opened for visitors only for a day on the 5th of Moharrum, the date of Hazrat Baba Farid's annual death anniversary. This underground cell lies just below the shrine of Hazrat Khwaja Moinuddin at his Dargah in Ajmer. According to Siar-ul-Aqlaah, once Baba Fariduddin was on a continuous fast for several days and did not get anything to eat to break the fast at the time of 'Iftaar'. During the night, in a state of acute hunger, he put a few small particles of stone into his mouth which immediately became particles of sugar. When news reached his Pir, Hazrat Qutbuddin, he said: "Farid is a treasury of sugar". Referring to "Tazkarat-ul-Aashqeen" the author of "Khazinat-ul-Asfiar" writes: "A trader was taking a caravan of camels laden with bags of sugar from Multan to Delhi. When he was passing through Ajodhan (now Pakpattan), Hazrat Baba Fariduddin casually asked him as to what was he carrying on his camels? The trader foolishly replied, "it is salt". Hazrat Baba Farid affirmed: "Yes, it may be salt". When the trader reached Delhi, he was perturbed to find that all his bags of sugar had turned into salt. He immediately returned to Ajodhan and apologised before Baba Farid for his impertinent behaviour. Baba Farid said: "If it was sugar then it shall be sugar." The trader returned to Delhi and was pleased to find that the salt had turned into sugar by the grace of God. This was the third confirmation of his title as Ganjshakar. Aan kaz shakar namak kunad-o-azz namak shakar. is a mine of salt and a world of sugar, because he turns sugar into salt and salt into sugar. During a period when Hazrat Baba Farid was wandering though jungles and mountains, practising his devotional mujahedas, one day, tortured by intense thirst, he went to a well in order to get some water. But he had neither any rope nor a bucket to draw out water from the well. As he was standing helplessly disappointed, he saw two deers approaching the well with water swelling up to its brim. The deers drank the water then went away. However, when Hazrat Baba Farid went near the well to retrieve water, it subsided. O Farid, We have accepted your chilla (40 days fast) and have selected you as one of Our beloved friends. We have included you among our sweet tongued devotees and have made you 'Ganjshakar'.